6 x 2 x 37.5 g packs Salmon Entrée (two servings per pack). 6 x 2 x 37.5g packs Whitefish & Tuna Entrée (two servings per pack). Total of 24 servings. 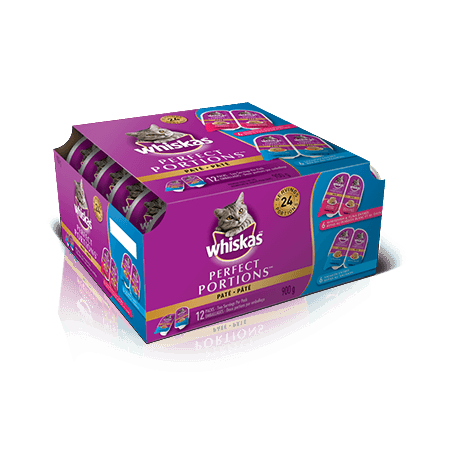 WHISKAS ® PERFECT PORTIONS™ SEAFOOD SELECTIONS ® is rated 4.7 out of 5 by 66. Rated 5 out of 5 by CASSANDRATON_353126445 from We have two cats who absolutely devoured the WHISKAS Perfect Portions Seafood Selections! They couldn't wait for more! We have had two very happy kitties! We did worry about potential digestion issues from switching foods, but noticed nothing and they were able to switch between hard and soft foods quite easily. I think our cats thought of this as a treat rather than just food. Will definitely continue to purchase in the future! Rated 4 out of 5 by SAMANTHAWON_353148031 from I have 2 cats, a 4 year old and a kitten. My 4 year old wasn't overly interested in either of these flavours - she ate some but didn't stay to finish it, my kitten on the other hand, couldn't get enough! He finished his own and then licked my 4 year old's bowl clean too! I would totally recommend trying all flavours before buying larger quantities. I would have had a lot of wasted food if I didn't have my kitten to finish them off. Rated 5 out of 5 by BECKYHSK_353135308 from Even though both flavours were seafood based, it wasn't as pungent as some wet foods. The packaging was easy to open and separate although the initial rip from the lid always squished out a little juice, maybe it needs a longer tab? It was very easy to put in the dishes and soft enough for the cats to eat without cutting it up. Both cats loved it and the kids even had fun feeding them. Would definitely buy again! Rated 4 out of 5 by MARTINEGQC_353147564 from First of all very easy to open (I am handicap) portion is purrrfect ;) , texture is excellent for my cat has problem chewing. The salmom was its favourite. The Whitefish one, it did not eat all of the serving. Both were filling more than the dry food as for it did not demand more food during the day. Thank you for the opportuny to try this product. I will definitely buy it. Rated 5 out of 5 by LAURENCNS_353140617 from The size of each individual portion is perfect for my cats, they clean the dish but aren't looking for more when they're finished. I also prefer the smell of the seafood varieties, it's easier on my nose than the beef flavored ones. My cats both enjoyed it each time it was given and there were no ill effects afterwards. I will definitely be buying again as a treat for them. Rated 5 out of 5 by KATHLEENKBC_353149272 from My cat is very particular about the food she eats. I've tossed a lot in the past because she won't eat it. 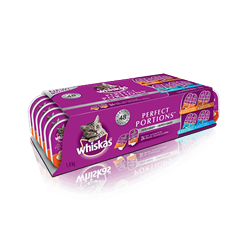 Whiskas Perfect Portions is something I was excited to try for free. My cat loved it. By the 2nd portion, she was racing to the kitchen as soon as she heard the foil being lifted. I will definitely be buying this again. 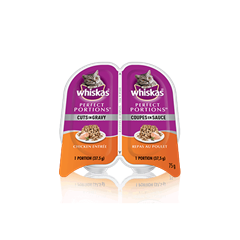 Rated 5 out of 5 by CAROLCON_353149803 from I have three rescue cats and they all loved this product.They were only 3 to 4 weeks old when we found them and when they where old enough to start solid food I used another brand.They sure thought this was a real treat when I used the coupon for the Whiskas food.This is what I buy now.The coupon sure helps when feeding three. WHISKAS® PERFECT PORTIONS™ SEAFOOD SELECTIONS Salmon Entrée: LIVER, SALMON, MEAT BY-PRODUCTS, CHICKEN BY-PRODUCTS, CHICKEN, NATURAL FLAVOURS, CALCIUM CARBONATE, SODIUM TRIPOLYPHOSPHATE, GUMS, COLOUR, MINERALS, DRIED YAM, METHIONINE, DEXTROSE, SALT, VITAMINS, L-CYSTEINE, D-XYLOSE, ERYTHORBIC ACID, GLYCINE, TAURINE, SODIUM NITRITE, SUFFICIENT WATER FOR PROCESSING. WHISKAS® PERFECT PORTIONS™ SEAFOOD SELECTIONS Whitefish & Tuna Entrée: LIVER, WHITEFISH, MEAT BY-PRODUCTS, CHICKEN BY-PRODUCTS, CHICKEN, TUNA, NATURAL FLAVOURS, CALCIUM CARBONATE, SODIUM TRIPOLYPHOSPHATE, GUMS, MINERALS, DRIED YAM, COLOUR, METHIONINE, DEXTROSE, SALT, VITAMINS, L-CYSTEINE, D-XYLOSE, ERYTHORBIC ACID, GLYCINE, TAURINE, SODIUM NITRITE, SUFFICIENT WATER FOR PROCESSING. 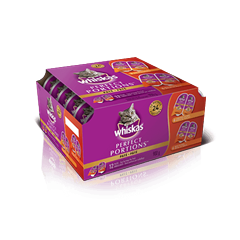 WHISKAS® PERFECT PORTIONS™ SEAFOOD SELECTIONS® is formulated to meet the nutritional levels established by the AAFCO Cat Food Nutrient Profiles for all life stages.